Jessica was raised in Vienna, but has lived in six more countries over the last decade, ranging from Poland, to the UK and Brazil. 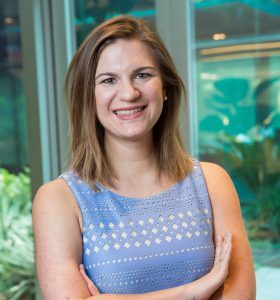 After completing her master’s and graduating from CEMS in 2016, she joined Roche, one of the largest healthcare companies worldwide. A global leadership development program allowed her to hold positions in Switzerland, the US and Brazil, before returning to the headquarters where she’s currently working as a Global HR Business Partner, based in Basel, Switzerland. I had a solid understanding of my current role due to previous work experiences I gained throughout my studies. What was eye-opening though is how difficult certain questions are in real life that you previously discussed at university as part of case studies. An example would be how the set-up of large global organizations influences decision-making, customer-proximity, and culture. Navigating through global vs. local dynamics sounded way easier at school than it is in practice! I intentionally decided to pursue the CEMS program to broaden my horizon and develop cross-functional business acumen. This sets me up for success in my current role where I’m often the interface between HR and other business functions. Throughout CEMS I had the pleasure to work with individuals from diverse cultural backgrounds which strengthened my cultural agility and helped me adjust to new settings quickly. This is essential to my current role in which I’m operating in a multi-cultural matrix environment. I truly believe that CEMS has also boosted my confidence to push myself out of my comfort zone which is the best starting point to learn and grow. I had the pleasure to experience the new WU campus and everything it offers which has been a wonderful! I particularly enjoyed having a drink or two with friends during spring/summer months. It was such a simple and fun way to end a long day, celebrate a milestone achieved, or simply cheer to life. Where should I even start? It is difficult to narrow it down to three moments, as I’m keeping countless great CEMS memories close to my heart. Exchange term at SSE: I had the opportunity to meet, work, and travel with smart individuals while experiencing the Swedish culture with all of its particularities – from cozy “fika” coffee breaks to celebrating Swedish Valborg in Uppsala. Graduation with 1,000+ fellow CEMSies: A weekend full of celebrations, being reunited with friends from all over the globe and celebrating the successful completion of our studies in a city I once called home. Can’t get any better than this! My friends: I’m probably most grateful for the outstanding people I met and became close friends with. Driven, committed, and full of energy and new ideas – often taking “work hard, play hard” to a whole new level. You might not see each other every week anymore as we’re all spread across the globe, but when you come together, it feels like back in the days. Stay curious and keep exploring: there’s always something new to learn and discover or someone new to inspire you and how you walk through life. Home is wherever you want it to be: by moving across countries time after time, you realize “feeling home” is all about the people you surround yourself with and the experiences you are gaining along the way. Very little, because I’m happy with how my CEMS experience evolved. I’d probably spend even more time attending all sort of CEMS-organized events such as regional forums. Those events provided a great platform to extend your network and meet like-minded people in a relaxed setting. Finding sufficient time for such activities is something you miss when student life is over!